What a deal this is!!! There was a similar deal this morning for £13.60 that at present is at 878° although sadly expired - Amazon has informed purchasers that they got the price wrong and have canceled peoples orders (including mine), even though most were going to have to wait until after christmas for delivery. The Bosch 100 Piece X-Line Accessory Set consists of the following-18 HSS-TiN metal drill bits dia.1-10mm, 7 TC masonry drill bits dia.3-8mm, 7 wood drill bits dia. 3-10mm, 3 flat drill bits, titanium, dia.16/22/32mm, 40 screwdriver bits L=25mm, 1 of each:PH 0/0/1/1/2/2/2/3/3/3, 1 of each:PZ 0/0/1/1/2/2/2/3/3/3, 1 of each:SL 4/4/6/6/7/7, 1 of each:HEX 3/4/5/6, 1 of each:T 10/10/15/15/20/20/25/25/30/40, 8 socket wrenches 5/6/7/8/9/10/11/13mm, 4 depth stops dia.3/5/8/10mm, 4 HCS holesaws dia.32/38/45/54mm, hand screwdriver, diameter gauge, torch, countersink bit, water level, allen key, magnetic universal holder, adaptor for socket wrench, adaptor for holesaw. Worth it for the ratchet screwdriver or a few of the drills alone. Same item is on sale for £25.98 at B&Q online (£39.98 in my store as shown in below picture) and has a list price of £40. 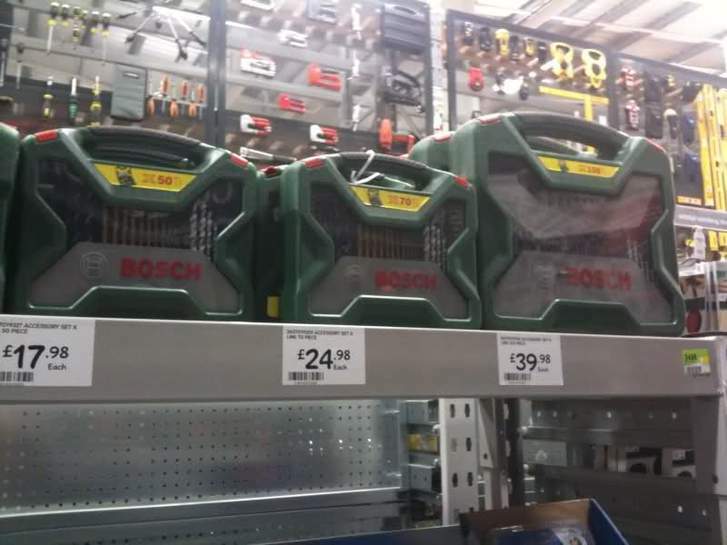 At least £30+ at most tool outlets. Hoping for some heat people!!!! Click the ' Use Voucher' link within and print of the Homebase 15% of voucher. Don't forget give them some heat. By clicking go to deal above you can check stock in your area. I've just been to B&Q this is the 50, 700, and 100 piece sets, the 100 piece is on the right at £39.98 !!! 5 star - small toolsVery good quality and excellent value Bosch Accessory … 5 star - small toolsVery good quality and excellent value Bosch Accessory Set. Large range of hard & very sharp drills and screwdriver attachments. They fit very neatly into the good quality easy carry case provided. Ideal for the professional or doityourselfer. Would be an excellent Christmas present. 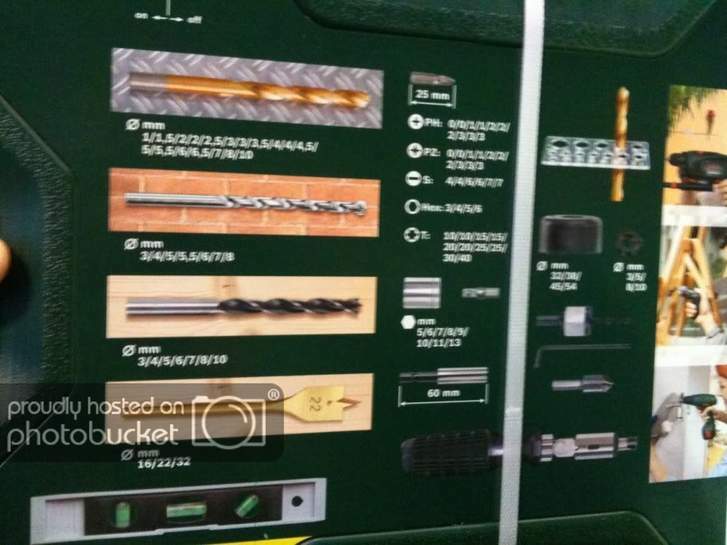 4 star - very complete setVery complete set of drill bits and scewdriver … 4 star - very complete setVery complete set of drill bits and scewdriver bits. Quality seems to be good after a couple of weeks use. Also includes a multi-angle ratchet screwdriver, torch etc.Good buy, hope it will be all I need for lots of DIY! for those that have no stock nearby you can order online this weekend using voucher code available at ]https//ww…cod this gives you 10% off, but you will have to pay £5.80 postage. So that works out at £18.71, still a fantastic price! If you use quidco you can also get 1.5% cashback and save another 20p !!! I can not confirm the code works as the weekend is not here yet! If you can't find stock in your homebase you should be able to get B & Q to price match and minus 10% of the difference. However you may need to prove some local homebase nearby has stock or they may refuse as can do as part of the conditions of the price match policy. if you can wait until the weekend, you can get it for £12.74, if you can't go get it for £14.99 NOW! Don't forget you can reserve and collect! Maybe you should change the title to include "voucher is for this weekend 4th-6th December"
Nice spot... Homebase normally rip you off for... erm... EVERYTHING! Correct, rip off prices for everything I only go there as a last resort. Have reserved to pick up on Friday so can use the voucher. Never did get the one I ordered from somwhere a year ago. Placed the order for a drill set and got sent a Bosch IXO in error. Excellent little tool for about £12.00. Great Price (and if you don't believe that then look ]HERE.) But look CAREFULLY!! was displayed incorrectly at the time you placed the above referenced order. Despite our best efforts, with the millions of items available on our website, pricing errors can occasionally occur. In our Pricing and Availability Policy (see amazon.co.uk/gp/…614), we state that where an item's correct price is higher than our stated price, we contact the customer before dispatching. All affected orders have now been cancelled. If you still wish to purchase this item, please place a new order online as from tomorrow, which will be charged at the correct price, when we dispatch it to you. Please accept our sincere apologies for the inconvenience caused by this error, and rest assured that we will continue to make every effort to maintain the accuracy of all prices on our site. me to, besides who cares now, this is even cheaper! Snap :-D heat added!! no excuse for my other half to put my mirror up!! it's been lying in box over 2years while he's been lying on the couch!! Heat up! for some quality tools. no excuse for my other half to put my mirror up!! it's been lying in box … no excuse for my other half to put my mirror up!! it's been lying in box over 2years while he's been lying on the couch!! Heat & rep added - thanks OP. I managed to put up 3 shelves and 4 cd/dvd storage racks just last night........ but then I also found this deal. Broke two of my brothers sh*te drills in the process though, which by fate, meant I looked for this deal! thanks reserved one, i hope the case is not to big, but it will definately save me some space and clutter, my tools are everywhere. These things take a lot of planning. You think he's just lazing there, … These things take a lot of planning. You think he's just lazing there, but there's a lot of very complex calculations going on in his mind...Heat & rep added - thanks OP. Uuuurrgghh too much information ! Don't worry i did not tell my mam that!! i was brought up very strict. 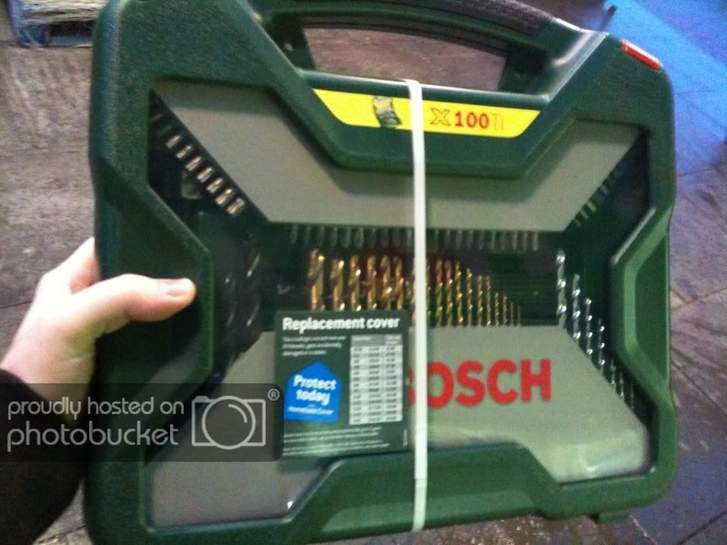 excellent, I've just bought my dad a Bosch drill he wanted for Christmas so this is perfect timing as an extra present. Thank you. Have reserved so thanks to op, heat added. Ive not had a cancellation email from Amazon yet and my original email said dispatch tomorrow so will wait and see. If I get both then son will get the second set. Clithoroe, Blackpool and Morecambe have it.